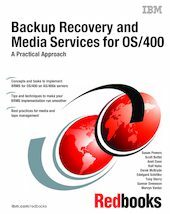 This IBM Redbooks publication preserves the valuable information from the first edition of A Practical Approach to Managing Backup Recovery and Media Services for OS/400, SG24-4840, which is based on CISC implementations. The updates in this edition were made to reflect the documentation and URL values that were available at the time of publication. This publication is unique in its detailed coverage of using BRMS/400 with tape libraries within a single AS/400 CISC system, or within multiple AS/400 CISC configurations across multiple levels of OS/400 ranging from OS/400 V3R1 to and through OS/400 V3R7. Coverage for BRMS for OS/400 for RISC and iSeries systems will be found in a redpaper that is planned for publication in 2001. This book focuses on the installation and management of BRMS/400 using tape libraries such as IBM 9427, IBM 3494, IBM 3570, and IBM 3590. It provides implementation guidelines for using BRMS/400 to automate your save, restore, archive, and retrieve operations. It also contains practical examples of managing your media inventory across multiple AS/400 CISC systems. This book also identifies functional differences between BRMS/400 and OS/400 CISC releases, where appropriate.